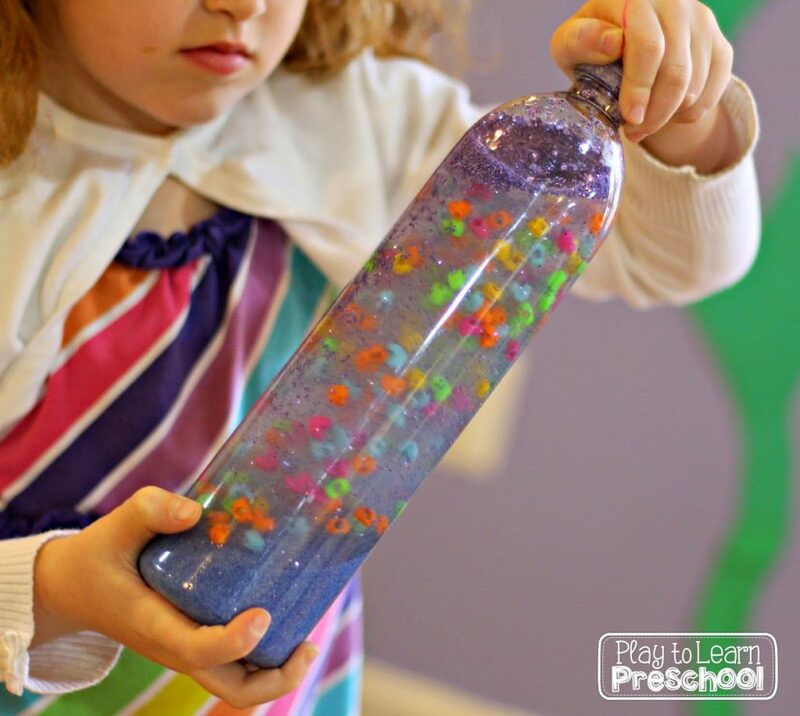 Discovery Bottles are an easy and fun way to offer kids a great sensory experience without all the mess. Don’t get me wrong, I love a good preschool mess, but sometimes it’s nice to change things up a bit! In our classroom, we have a handful of students who are a bundle of energy at this time of year. They often run around the room during centers and are in constant motion. Please tell me it’s not just us! I created these weighted discovery bottles just for them. High energy kids need to move and use their muscles. Not only are these bottles visually interesting, they also require a bit of strength and energy. The technical jargon is propioceptive input, but we’ll just say that these bottles are guaranteed to tire out your high energy kiddos! 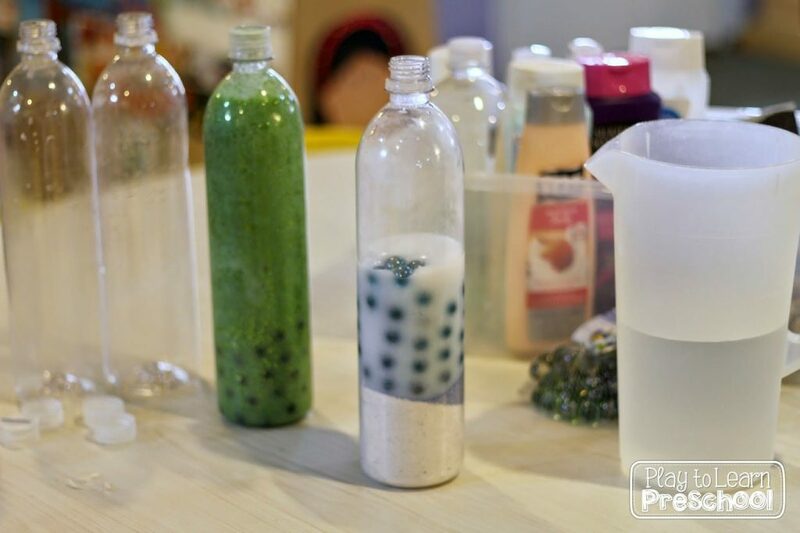 All of the ingredients for our weighted bottles came from the dollar store: hair conditioner in different colors, colored sand and marbles. We also added glitter, beads and rocks to a couple of them. To make a weighted bottle, begin by filling it about 1/3 – 1/2 with something heavy. 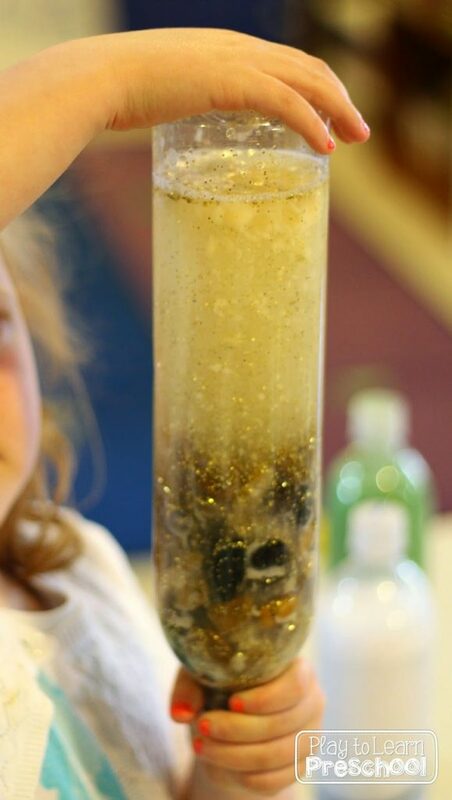 We used sand and marbles on this one. Then, we added hair conditioner. That serves to thicken up the water and make it just a little bit harder to mix. Finally, fill the rest of the bottle with water. 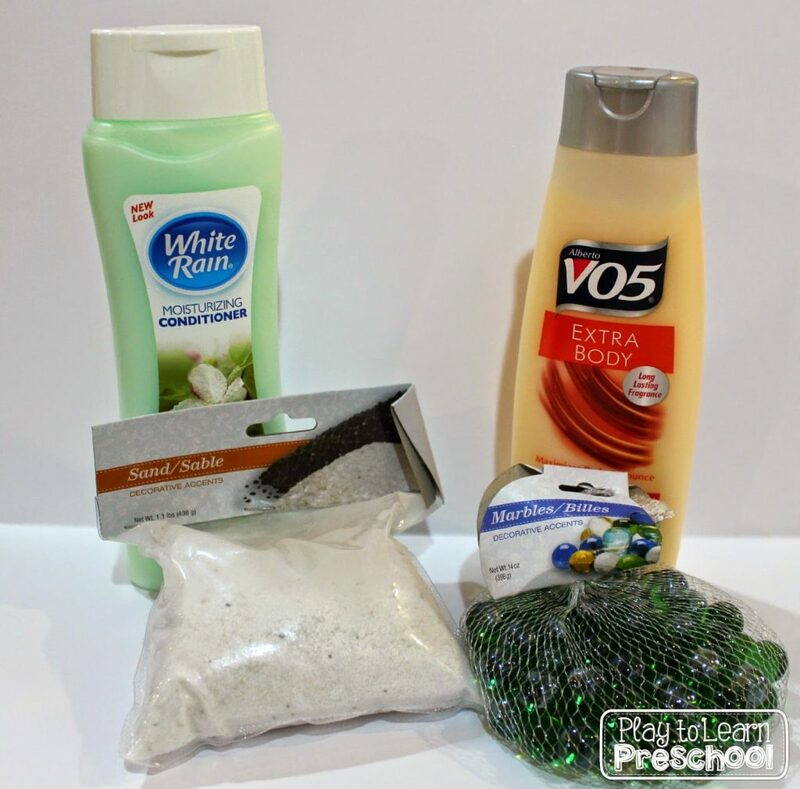 Another variety of weighted bottle has small rocks, cream colored conditioner and gold glitter. This one looks so pretty mixed together, and boy is it heavy! 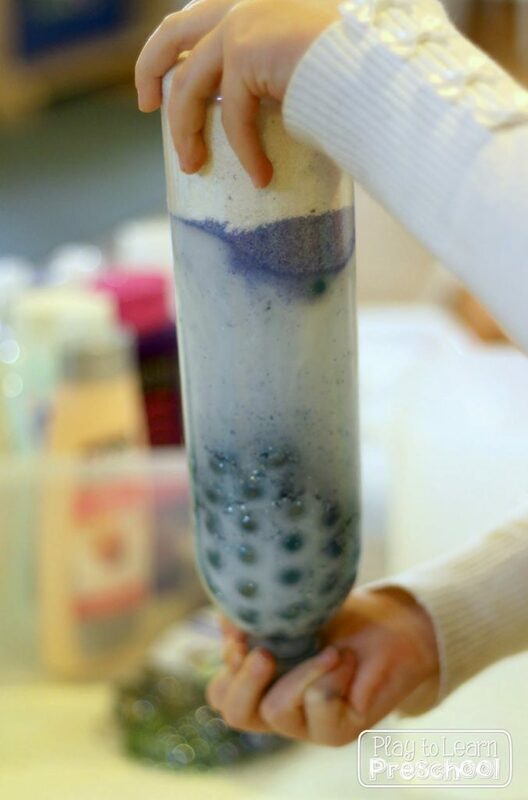 This bottle has blue sand, heart beads, a bit of clear hair gel and purple glitter. So much fun! We line all of the weighted bottles up on a shelf, and the students are free to use them during centers. I just can't get enough of these!!! How brilliant to consider proprioceptive input! Definitely a must have for any class! These are PERFECT for my toddler son. He seeks heavy work on a regular basis! 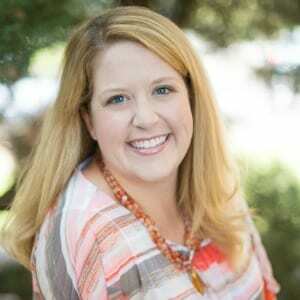 Great ideas for fillers! Oh! Love this! 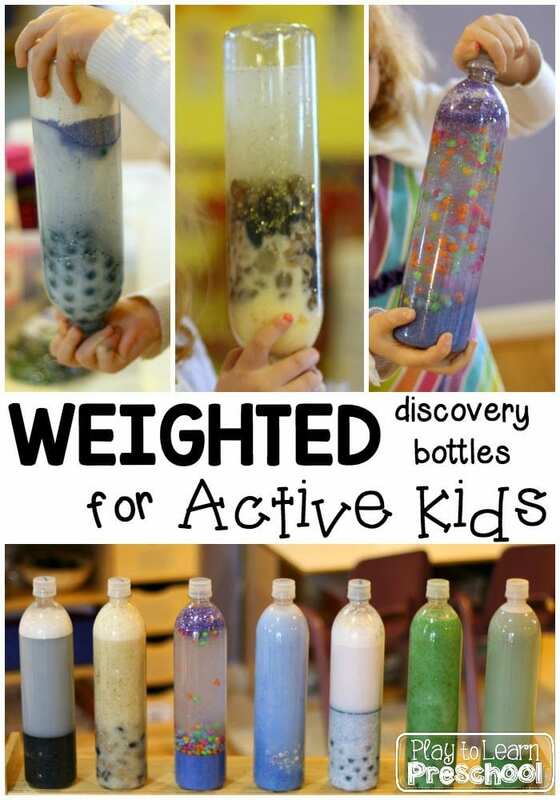 I can't wait to try making a weighted discovery bottle of our own! I hope your kids love them as much as ours do! What bottles are you using in these pictures? I usually make my discovery bottle in 3oz travel bottles from the dollar store, but obviously those aren't going to be big enough for these heavy ones. I'm excited to make these for my sensory-seeking kids (and have passed this idea onto several friends). Hi! Thanks for your interest. They are "Smart Water" bottles. I like the mini bottles that you've made too. I'll add them to our to-do list.